This post contains a paid collaboration with Appletiser. I’m soooo happy! And you wanna know why? 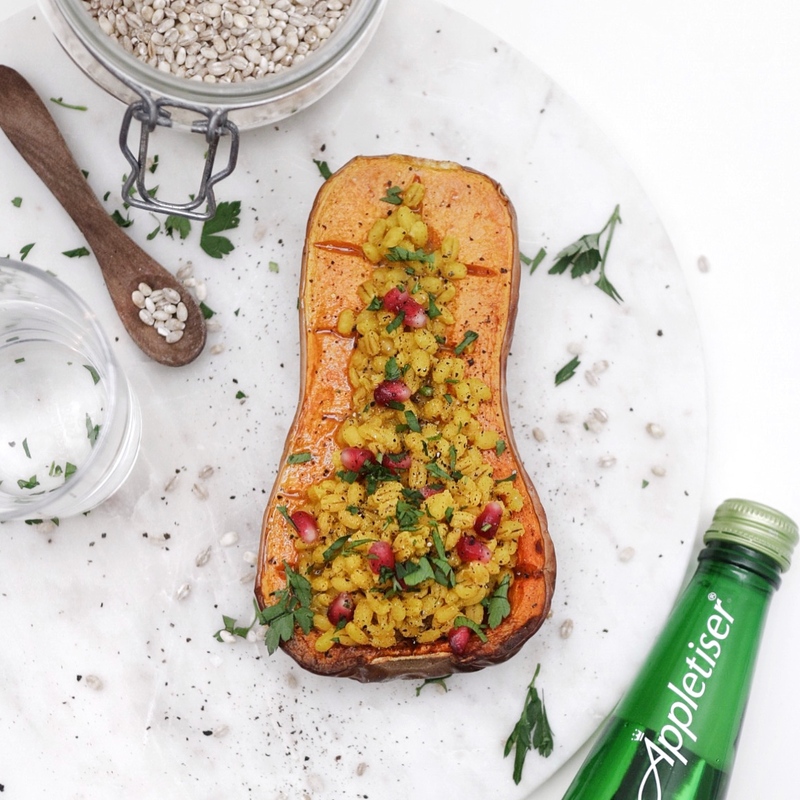 Cause I will be collaborating with Appletiser for the remainder of 2018, bringing you one tasty, vegan and refined sugar free recipe per month whilst sipping on a cool, fresh Appletiser! For the first month I wanted to bring you a colourful recipe that includes one of your 5 a day whilst bringing some vibrant colours to a grey winter day – cause to be honest: we have plenty of those in London! 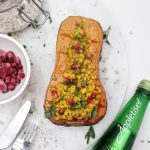 I have been loving roasted Stuffed Butternut Squash over the past few months – in many shapes and forms, so it was a natural for me to include a roasted butternut squash in the recipe! And since trying our dried bean mixes at work, I have had a thing for Pearl Barley – so you can imagine that I could not combine these two amazing items here. In regards to roasting your Stuffed Butternut Squash: I prefer to use a little Extra Virgin Olive Oil to brush the squash before it goes into the oven, but you could technically create this recipe without the addition of oil, if you swing that way. 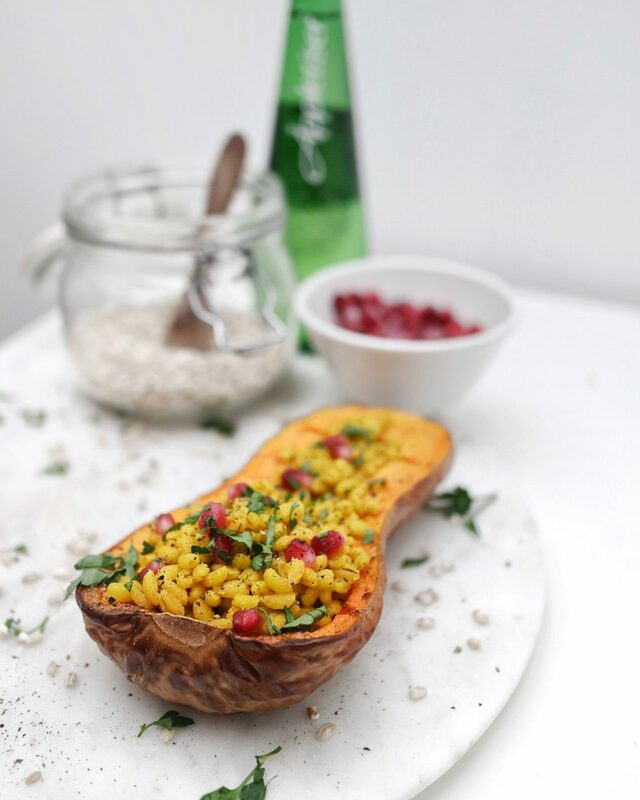 Simply add a little ovenproof dish with a little water to your oven, so that your squash doesn’t get too dry. I definitely recommend to cut little slits into your squash before roasting – this helps the squash to roast all the way through easier and avoids the unwanted ‘burnt outer edges & tough inside’ phenomenon. 1. 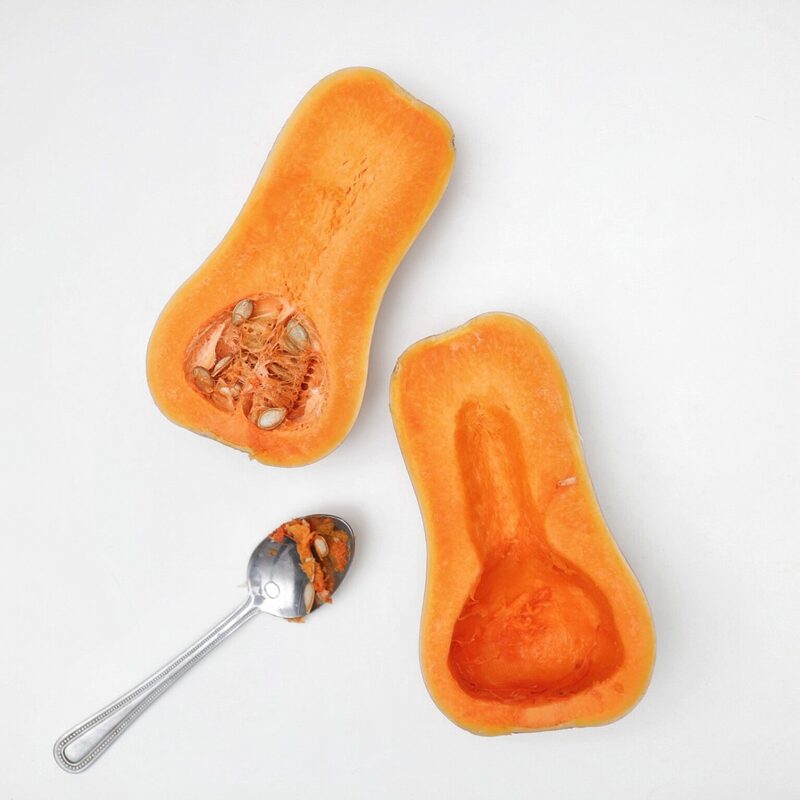 Start by washing the butternut squash and removing any outer stains (or supermarket stickers!) under hot water. Then using a large, sharp knife cut the squash down the middle, so you get two equally sized halves. 2. Using a teaspoon or tablespoon start removing the seeds alongside the ‘stringy’ flesh that surrounds them. 3. Using a sharp pointed knife cut slits into your squash – vertically and horizontally. This will help the squash to get evenly roasted in the oven. Brush the Extra Virgin Olive Oil across the squash, and then place it in the oven with the insides facing up. Roast for about 30-35 minutes until your squash is soft and the outer skin is lightly browned. 4. 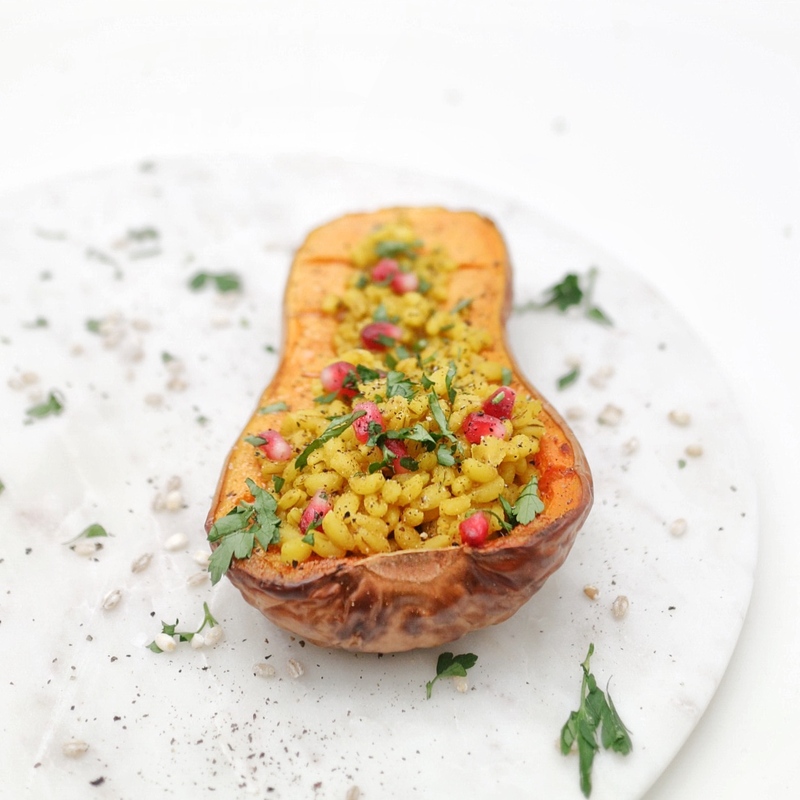 Whilst the squash is roasting, you can prepare the filling by placing the dried Pearl Barley in a medium size pan. Add all spices to the barley, then add the boiling stock water to cover the Barley. Cook on a medium heat and make sure to stir regularly so that the spices get evenly distributed and the barley does not get stuck to the bottom of the pan. 5. You will be able to tell when the barley is ready as it will have soaked up most of the water and more than doubled in size. If you feel like the barley is getting to dry during the cooking process, feel free to add additional water. 6. 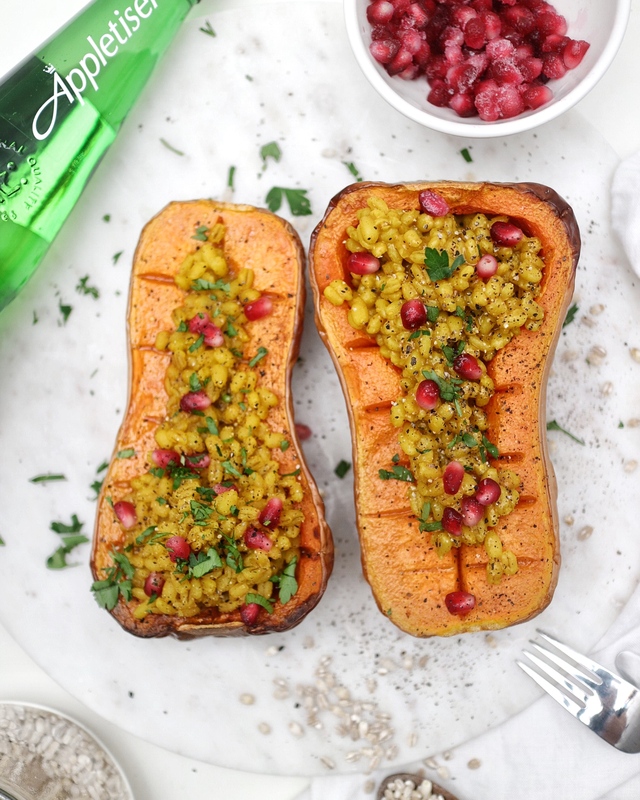 Once your squash is done roasting and the barley is fully cooked assemble the dish by filling the barley into the squash, then sprinkle with pomegranate seeds and chopped coriander. Season with salt & black pepper to taste. 7. Enjoy with a bottle of fresh Appletiser! Pro Tip: You can use both fresh as well as frozen pomegranate seeds. I personally always buy a fresh pomegranate & then de-seed it in a bucket of cold water (mainly to avoid the mess, but it’s also much easier to de-seed under water!). I keep my seeds in a freezer bag because I mostly only use small amount of them and don’t want them to go off and let them go to waste. Add the frozen pomegranate on the top right after taking the barley off the stove – the heat of the barley will quickly de-frost your pomegranate seeds! Looking for more refined sugar free & vegan recipes? 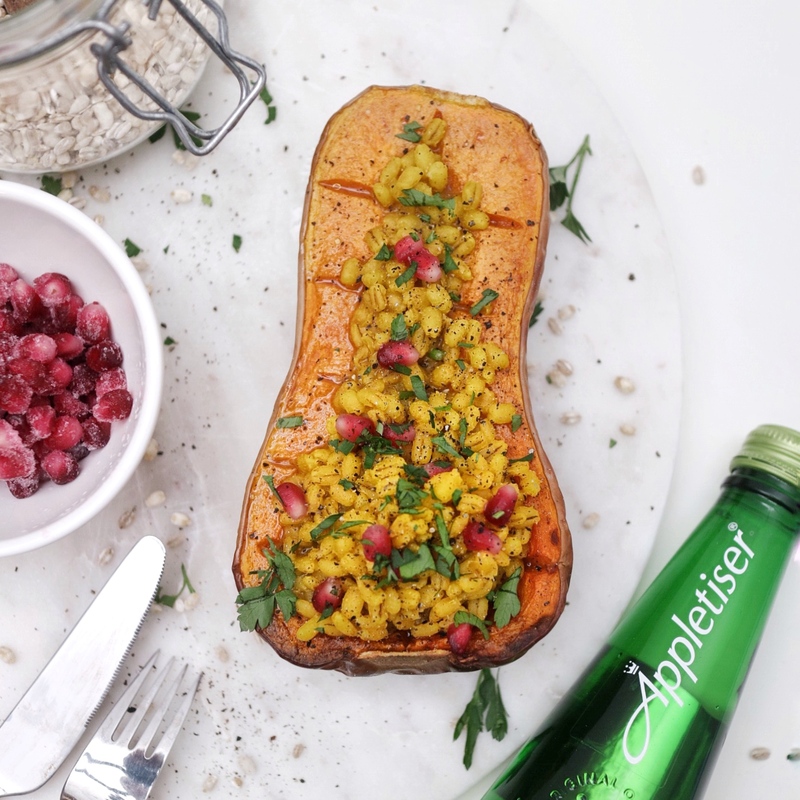 Then keep an eye out as I will be posting a recipe per months in collaboration with Appletiser this year! Getting inspired by photos of yummy food? Make sure to follow me on Instagram to keep inspired with more tasty food photos!